The Race To The Tar Sands Has Begun! Saturday February 13th, was the opening day of the 2010 Winter Olympics in Vancouver, Canada. Meanwhile here in London, a different kind of sport was taking place. 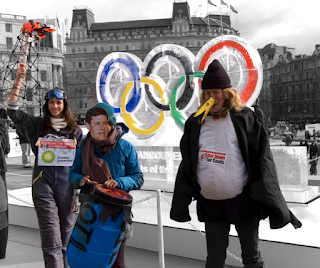 In the spirit of mischief and fun, Canada House in Trafalgar Square was the centre of focus for the three oily teams: BP, Shell and Total, who took their places to ‘Race to the Tar Sands'. Curling, one of the olympic sports, is being put to good use to help sweep out BP, Shell, and RBS as they all race headlong into the Tar Sands. 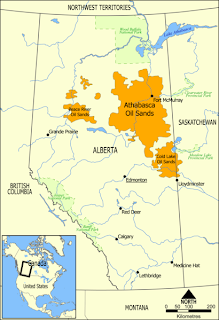 The Canadian Tar Sands in Alberta is one of the biggest examples of ecocide on planet earth. The extraction of unconventional oil from the Tar Sands (called the dirtiest oil on the planet) has caused, and will continue to cause, extensive destruction and loss of widespread ecosystems to an area the size of England. There is currently a global 'race to the tar sands' and the main competitors are Shell, Total and BP who are all in pursuit of the profits to be gained from the extraction of unconventional oil from the Canadian Tar Sands, regardless of the environmental and social costs and opposition from local communities directly affected by the extraction. Although the oil is being extracted in Canada, there are direct links to the UK. Royal Bank of Scotland, HSBC and Barclays have all invested in the tar sands. Britain’s very own BP are about to reverse their decision to stay away from the destructive project, making Beyond Petroleum nothing more than a Broken Promise. This action is in solidarity with Canadian First Nations groups whose lands and communities are being devastated in the name of corporate profit, and who have called for a moratorium on the tar sands.